What is the perimeter of a square of area 36? The area of a square is the square of the length of its side (all sides are equal in a square). 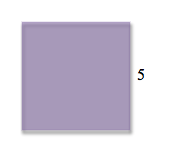 If the area is 36, then the length of each side is 6. 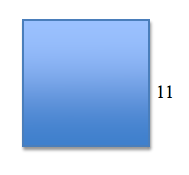 The perimeter of a square is 4 times the length of its side. Therefore, 4 times 6 is 24. Which of the following is NOT a quadrilateral? Quadrilaterals have 4 sides. A nonagon has 9 sides. What is the perimeter of a square that has a side measuring 3 inches in length? Perimeter is the sum of all the sides. For a square, . 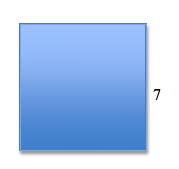 What is the perimeter of a square that has a side measuring 1 inch in length? 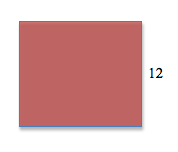 To find the perimeter of this square, add all four sides together. Even though we are only given one side's length, every side of a square always has the same length! To find the perimeter of a square, simply add all four sides together. Even though we are only given one side's length, squares always have four, equal sides! To find the perimeter of a square, add all four sides together. Since each side of a square is the same length, we only need one side's length to figure out the perimeter of a square! To find the perimeter of a square, simply add all four sides together. Since squares always have four equal sides, we only need the length of one side to determine the perimeter! If John draws a square with a side of 7 centimeters, what is the square's perimeter? Which formula would you use to find the perimeter of a square?